A wonderful breed, brains and beauty combined. 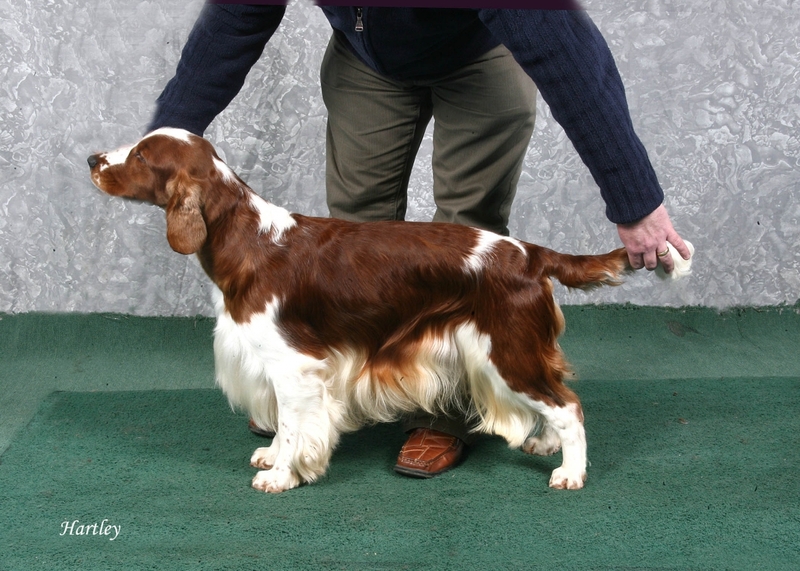 Welsh Springers make excellent additions to an active family and they rejoice in being part of the home environment. All our WSS are hip scored and eye checked clear. Any visitors to Glenbrows are sure to be met by several WSS as they come through our front door. We have enjoyed considerable success with our WSS in the show ring, including Best in Show at several breed club championship shows and twice our WSS have been rewarded with Best of Breed at Crufts. Moreover, they are firm family friends, if you want a dog that is truly yours, then WSS maybe the breed for you. Our history with WSS commenced when the great late Sh Ch Cleavehill Ceri for Glenbrows decided that as a very shy 2 year old that she wanted to live with us! 18 months later this 'shy creature' blossomed to become our first WSS Champion. Ceri taught us much about the breed, and with out her we would not be where we are now, all our home bred WSS descend from Ceri. Her show career was relatively short lived, she preferred to be at home,but she gained Best of Breed with all her qualifying challenge certificates. Perhaps though her greatest accolade is that both of our children learnt to walk by holding on to her tail! Our second WSS, the male Sh Ch Ferndel Storyteller for Glenbrows JW ShCM (Logan) is also jointly responsible with Ceri for all our current WSS. Top sire in the breed twice, he has left a legacy behind him. Logan's greatest day came at Crufts 2005, when watched by many he was awarded Best of Breed at Crufts, a great champion but also a great family dog, later that same evening Daniel, then aged 2 fell asleep against Logan whilst eating pizza. To the present day, the wonderful Sh Ch Glenbrows Picture This JW ShCM, 'Luka'. a winner from his first show, Luka claimed his show champion title in 14 days, claiming Best of Breed in 3 consecutive shows. His children too are winners, siring to date 6 Junior Warrant winners, his son and daughter from his first litter, our beautiful Tribute and stunningly handsome Timelord both received their Junior Warrants whilst still puppies and are both close to completing their Champion titles, Timelord recently receiving Best of Breed Crufts 2012. Although sadly no longer with us, Ceri and Logan, responsible for the Glenbrows WSS dynasty are pictured here below as we like to remember them, in their prime. 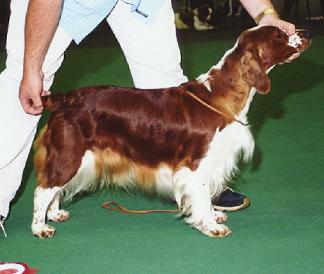 (left)Sh Ch Cleavehill Ceri for Glenbrows, winning Best in Show at the Welsh Springer Championship Show 2002. (right) Sh Ch Ferndel Storyteller for Glenbrows JW ShCM in his greatest hour, Crufts Best of Breed 2005. Both of these prestigious awards have since been claimed by home-bred Glenbrows WSS, a fact of which we are very proud.